Hey everyone, it’s Danielle from Busy Mom’s Helper! If you’re like me, you’ve been trying to eat healthier once the holiday season passed. Since I’m a HUGE fan of chocolate and sugary desserts, it’s a bit of a challenge, so I need to find tasty things to keep me happy and on track. 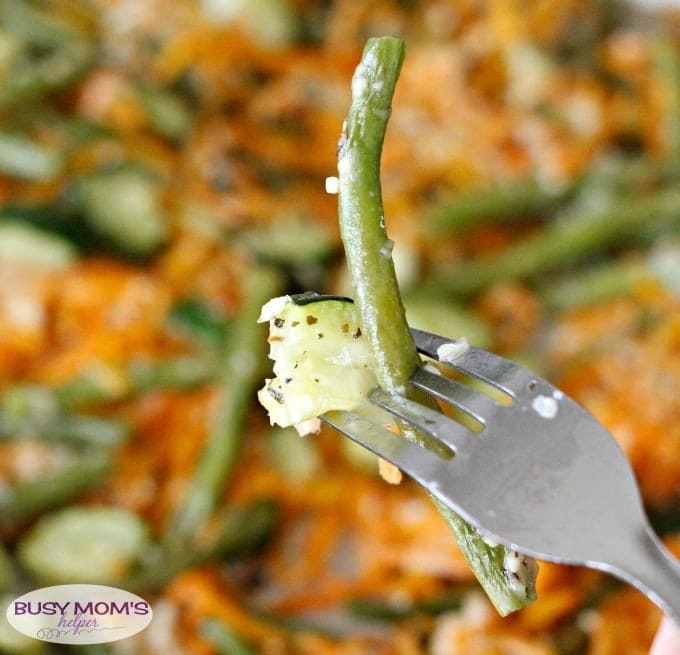 Today I’m sharing one of my new favorite vegetable side dish recipes! I’m really a fruit girl at heart, so I do so much better at a balanced diet when I things like these yummy Garlic & Parmesan Baked Vegetables! You can mix and match which vegetables you use in this recipe based on what you like best or what’s on sale. For this batch I used string beans, zucchini and carrots. Afterwards I included tomatoes (I know, a fruit, but whatever) and it really added to the flavor! Preheat oven to 425 Degrees F. Spray or line a baking sheet, set aside. In a large bowl, toss together all of the ingredients (except butter) until the vegetables are evenly coated. Spread onto the prepared baking sheet. Bake for 20-25 minutes, or until veggies are tender. If desired, top with melted butter. Doesn’t get much easier than that, does it? I love easy recipes, especially when they end up tasting so dang delicious! Be sure to join me over at Busy Mom’s Helper for more easy recipes! Find us on Facebook for easy recipes, free printables, simple crafts, and things to do in Dallas. I’d love to have you join me over there! wow sounds AMAZING! Pinning for later, I need more of these recipes!